Multiple traffic alerts have been issued by the Cherry Hill Police for work taking place between April 14th and April 17th. You can click HERE to read the Alerts including news about Kresson Rd., Springdale Rd., Old Orchard Rd., and Route 70. At the Council Meeting on Monday April 9th, the two winning South Jersey Youth Championship Boys Basketball teams from Cherry Hill were honored with a proclamation. Both the 4th and 8th grade A Teams have clinched the Championship titles in their respective age groups and the teams, along with their parents and coaches joined the Mayor and Council in honoring their success. We are still seeking applications for the Cherry hill Business Council, which is a volunteer committee comprised of business leaders throughout the town. The Business Council will be made up of CEO’s, owners, and leaders from businesses of all sizes and will serve as an incubator, providing a forum for business leaders to share their opinions, concerns, and suggestions about how the Township can provide them better support and assistance. You can read more about the Business Council by clicking HERE. See International Pianist Greg DeTurk This Sunday! In an effort to provide more reliable communications with residents, Cherry Hill has begun sharing services with Camden County and the Department of Emergency Management to implement Global Connect as our Emergency Notification service provider. This Emergency Notification System gives those in charge of Public Safety a chance to reach out to the public in case of an emergency event. This system, combined with our other emergency alert methods, is designed to get emergency messages to you the public, quickly and effectively. This does not preclude you from calling 911 if you need emergency information; it simply provides an opportunity for us to disseminate critical information to you if and when the need arises. There are many ways to be notified and you can update your information by clicking HERE. Cherry Hill Township received recognition for the Township's environmental achievements through the New Jersey Department of Environmental Protection’s (NJDEP) Stewardship program. Cherry Hill was recognized for its voluntary and proactive measures taken to go beyond compliance in an effort to improve the environment and ensure a sustainable future. Councilwoman Silver visited the Cherry Hill Public Library to present a proclamation recognizing April as Parkinson's Awareness Month on behalf of Cherry Hill Township. The Township commends and proudly supports the efforts of local volunteers and organizations. You can read stories in the Courier Post and the Cherry Hill Sun about a Marrow Drive taking place this Saturday to help a Cherry Hill man. Friends and relatives of Paul Badtorff are holding a blood marrow drive from 10:00 am to 4:00 pm, at the Cherry Hill Youth Athletic Association, 150 Deland Ave., in the Kingston Estates section of the Township. Please join us for Cherry Hill Night at Campbell's Field on May 22nd! Mayor Cahn will be throwing out the first pitch and we encourage you to bring your friends, family and your neighbors for a night out full of community fun! Tickets are only $7 each. Be sure to wear your RED and hope to see you all there! 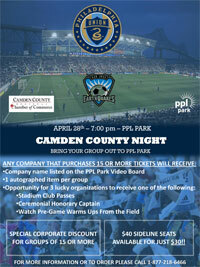 Please see the flyer here for event and ticket ordering information. 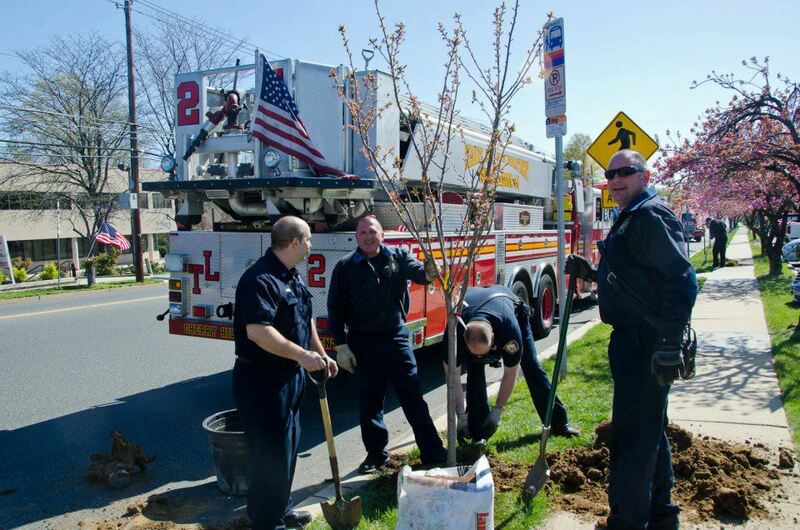 On April 7th, cherry trees were planted on Chapel Avenue by Cherry Hill’s firefighters as they have every year since 1973. So far 1,416 trees have been planted in Cherry Hill since 1973. On the same day, the American Legion Post No. 372 War Veterans placed American flags and yellow ribbons on to the two-mile avenue of cherry trees. You can watch a segment from 6 ABC on the Cherry Trees with comments from Joe Zanghi. In addition, students, parents and teachers at Joyce Kilmer Elementary School raised $200 dollars to buy two cherry trees for planting. Cherry Hill will hold its Green Hands Cleanup on Saturday, April 21st from 10:00 am – 1:00 pm. Volunteers will meet at Croft Farm Arts Center, 100 Bortons Mill Road and the cleanup will go on rain or shine. Volunteers will help clean up, maintain and reinforce trails and clean up trash and debris along the roadway and trails. Green Hands Volunteer is a national movement. You can find more information here. While Cherry Hill Township will be focusing our efforts, if a group or family is interested in having a clean-up near their home or park, the Township can supply trash bags and some other supplies. For more information or to get involved, contact Abbey Greenberg at 856-488-7878. Save the Date to come enjoy all things Green at the 2012 Earth Festival, Saturday April 28th from 10:00 am - 3:00 pm at Croft Farm, 100 Bortons Mill Rd. There will be free admission, with food and crafts available for purchase. This event is presented by Sustainable Cherry Hill, in collaboration with Cherry Hill Township and the Cherry Hill Arts Board. Click HERE for more information. You can read more about the launch of the Mayor's Wellness campaign at Earth Festival by clicking HERE. The Cherry Hill Arts Board and Sustainable Cherry Hill present an evening of Environmentally Friendly Fashions on Thursday night, May 3rd at 7:00 pm at the Croft Farms Art Center. Join several of Cherry Hill's most prominent women as they model environmentally fashion to show that green is the new black. You can get more information by clicking HERE. The Cherry Hill Alliance on Drug and Alcohol Abuse and SCOPE present a program for adults: Bullying, Cyber-bullying and Teen Depression. This free will be held at the Cherry Hill Public Library on Thursday May 31st from 7:00 pm - 8:30 pm. You can see the flyer for the event by clicking HERE. The Cherry Hill Sun had a great article looking at the Cherry Hill Retired Men's Club. Cherry Hill offers numerous Senior activities. You can learn more by clicking HERE. The Camden County Freeholder Board’s Division of Senior & Disabled Services and the Surrogate’s Office will hold free legal workshops for senior and disabled residents to receive a Last Will and Testament, an Advance Directive for Health Care (Living Will) and Power of Attorney at the County Store at Voorhees Town Center on April 16. Space is limited, please register at (856) 566-2920. Join Sustainable Cherry Hill, the Camden County Regional Chamber Chamber of Commerce and Cherry Hill Township Mayor Cahn for the "Greening Your Bottom Line" Business Breakfast on Tuesday May 1st at Caffe Aldo Lamberti. Click HERE for more information. In honor of National Volunteer week, the volunteers of the Jr. Friends of the Cherry Hill Public Library cordially invite you to attend a Fashion Show and Luncheon Fundraiser on April 21 at 11:30am! To order tickets, please call Nancy at 856-903-1234 or click HERE! Did you ever think your library fines could turn into a good thing? If you return your overdue library items April 9th -15th, they can help fight hunger in your community! Patrons with overdue fines can have them erased by donating non-perishable food items to benefit the Food Bank of South Jersey. For each food item donated, the Cherry Hill Public Library will forgive fines for one overdue library material. (Not including lost book or Unique Management fees.) Food donations are welcome from patrons who do not need to clear fines! For more information, click here to see a list of the most needed items or contact the Cherry Hill Public Library at 856-667-0300. On Sunday April 29th, Camden County will hold a Feline-Only Spay/Neuter Event at the Carman Tilelli Community Center, 820 Mercer St. in Cherry Hill. Through the Camden County office of shared services and the AWA, Cherry Hill can receive low cost services like these mobile clinics for residents. To make an appointment for a cat (owned, stray or feral), call 856-424-2288 ext. 105 or send an e-mail to clinic@awanj.org. Visit www.awanj.org for more information on this program and on low-price spay/neuter for any dog or cat from any area. People ask if it’s worth it to buy more energy efficient – and often more expensive – appliances and other household items. You need to look at the payback period -- the amount of time you must use an appliance or system before you begin to benefit from energy savings. For example, if you buy an Energy STAR washing machine that costs $100 more, but uses $20 less electricity each year, you would begin saving money after five years. Your payback period would be five years. Since most appliances last at least 10 years, you would save $100 over the life of the appliance and reduce your carbon footprint as well. For more information, contact Nancy Axelrod, Cherry Hill’s Energy Outreach Coordinator at 856-432-8741 or naxelrod@chtownship.com. Multiple traffic alerts have been issued by the Cherry Hill Police for work taking place between April 14th and April 17th. You can click HERE to read the Alerts [http://www.cherryhill-nj.com/CivicAlerts.aspx?AID=87] including news about Kresson Rd., Springdale Rd., Old Orchard Rd., and Route 70. You can read stories in the Courier Post [http://www.courierpostonline.com/article/20120412/NEWS01/204120306/Marrow-drive-set-aid-Cherry-Hill-man] and the Cherry Hill Sun [http://sj.sunne.ws/2012/04/10/cherry-hill-resident-needs-community-to-save-his-life/?utm_source=dlvr.it&utm_medium=twitter] about a Marrow Drive taking place this Saturday to help a Cherry Hill man. Friends and relatives of Paul Badtorff are holding a blood marrow drive from 10:00 am to 4:00 pm, at the Cherry Hill Youth Athletic Association, 150 Deland Ave., in the Kingston Estates section of the Township. Please join us for Cherry Hill Night at Campbell's Field on May 22nd! Mayor Cahn will be throwing out the first pitch and we encourage you to bring your friends, family and your neighbors for a night out full of community fun! Tickets are only $7 each. Be sure to wear your RED and hope to see you all there! Please see the flyer here [http://www.cherryhill-nj.com/Calendar.aspx?EID=135&month=5&year=2012&day=15&calType=0] for event and ticket ordering information. Cherry Hill will hold its Green Hands Cleanup on Saturday, April 21st from 10:00 am – 1:00 pm. Volunteers will meet at Croft Farm Arts Center, 100 Bortons Mill Road and the cleanup will go on rain or shine. Volunteers will help clean up, maintain and reinforce trails and clean up trash and debris along the roadway and trails. Green Hands Volunteer is a national movement. You can find more information here [http://www.greenhandsusa.com/home] . While Cherry Hill Township will be focusing our efforts, if a group or family is interested in having a clean-up near their home or park, the Township can supply trash bags and some other supplies. For more information or to get involved, contact Abbey Greenberg at 856-488-7878. Did you ever think your library fines could turn into a good thing? If you return your overdue library items April 9th -15th, they can help fight hunger in your community! Patrons with overdue fines can have them erased by donating non-perishable food items to benefit the Food Bank of South Jersey. For each food item donated, the Cherry Hill Public Library will forgive fines for one overdue library material. (Not including lost book or Unique Management fees.) Food donations are welcome from patrons who do not need to clear fines! For more information, click here to see a list [http://www.foodbanksj.org/documents/4_most_needed_items_list.pdf] of the most needed items or contact the Cherry Hill Public Library at 856-667-0300. On Sunday April 29th, Camden County will hold a Feline-Only Spay/Neuter Event at the Carman Tilelli Community Center, 820 Mercer St. in Cherry Hill. Through the Camden County office of shared services and the AWA, Cherry Hill can receive low cost services like these mobile clinics for residents. To make an appointment for a cat (owned, stray or feral), call 856-424-2288 ext. 105 or send an e-mail to clinic@awanj.org. Visit www.awanj.org [http://www.awanj.org/] for more information on this program and on low-price spay/neuter for any dog or cat from any area.